Due to having lots of extra milk, and since we are already making kefir and sour cream (and yogurt that I started this afternoon), we needed to do something with the extra milk. LOTS of extra milk. 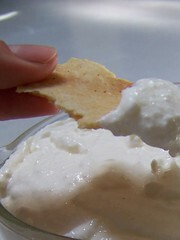 So today I made soft goat milk cheese and crackers to eat it with. It is SO good!!! 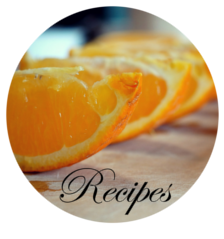 This book has a lot of recipes and this recipe (from this book) if a favorite one. Add 2 cups of starter (buttermilk) to 1-1/2 gallons of warm raw milk. Cover and set in a warm place 12 to 24 hours or until thick and clabbered. Place a small container into a larger one filled with warm water, double-boiler style, and heat the curds and whey slowly at the rate of 2 degrees every 5 minutes. Heat to a temperature of 100 degrees F. in 30 to 40 minutes, then hold at this temperature until the curds had developed the desired firmness. 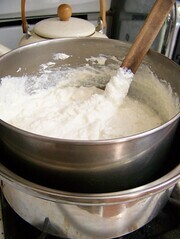 Keep stirring gently to prevent the cubes of curd from sticking together and forming lumps. 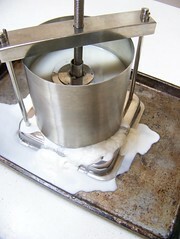 As it becomes firmer, the curd will need less stirring to keep it from lumping. Test the curd for firmness by squeezing a small handful gently, then releasing it quickly. If it breaks apart easily and shows very little tendency to stick together, it is ready. 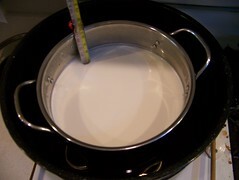 The curd should reach the stage 1-1/2 to 2-1/2 hours. 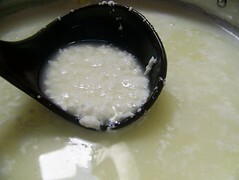 When the curd is firm, remove the container from the warm water. 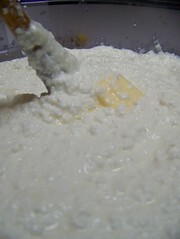 Pour the curd and whey into a colander that is lined with cheesecloth and that sets into a large container. Then, lift the cheesecloth with the curd inside and let it drain. When most of the whey has drained off, remove the curd from the cheesecloth and put it in a container. Stir the curd or work it with your hands to keep the curds separated. When it had cooled to 90 degrees F., then you need to press it for one hour. If you do not have a cheese press, a colander lined with cheese cloth works too. To weight it, place a plate that just fits into the colander and place a few bricks (or another heavy object) on it. That is how we pressed our cheese before we got this nifty-difty cheese press from Hoegger’s Goat Supply! Then add 4 tablespoons of butter and 3/4 teaspoon of baking soda. Chop until the curd is quite fine, and the butter and soda are thoroughly mixed in. Press mixture down into a bowl or crock and let it stand in a warm place for 2-1/2 hours. 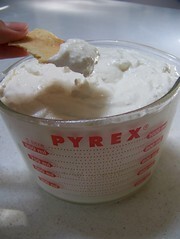 Then, put the curds into a double-boiler with 2/3 cup sour cream and 1-1/4 teaspoons salt, and heat slowly. As the mixture begins to heat, stir until all ingredients melt into a mass. Then pour it into a well-greased bowl and allow it to cool. It is ready as soon as it is cold. Enjoy it with your homemade crackers! It is quite important to plan what time you set out the milk in the evening…and what time you start it in the morning. 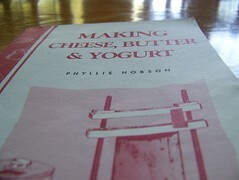 Unless, like I did once, you want to be making cheese from late at night into the wee hours of the morning! This batch took a little over 7 hours! But each batch varies. 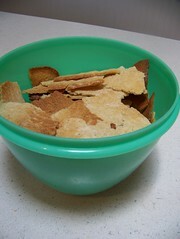 In a large bowl, combine the flours, sugar, and salt. Cut the butter into the flour until the mixture resembles a course meal. Blend in the milk slowly, using only enough to form a dough that will hold together in a ball. Divide the dough onto two well-greased baking sheets and roll out very thin. 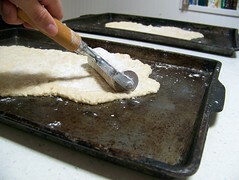 If desired, lightly sprinkle the dough with salt. Prick them with a fork. Bake in the preheated oven for 20 to 25 minutes, or until lightly browned. Cool and break up. Store in a sealed container. Yield: about 50 crackers. Ahh…I’m about to go get some more to eat! They are SO good!! I can attest that they are *very* yummy! I don't think there were any crackers left….and the cheese is so good! Thanks all of you for commenting on my blog and wishing me a happy birthday. I had a verry good day! Sorry I haven't written back yet. Yes, its my turn. I will get it out tomorrow. 🙂 sorry I haven't written back yet. My name is Keysia and I'll be 16 this week! 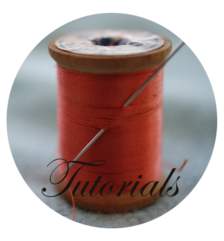 I just wanted to tell you guys that I absolutely love your blog! 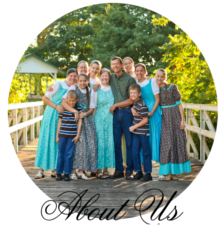 You live the kind of simple life that I love! And you always look like you're having fun! would you mind if I added you to my friends list? 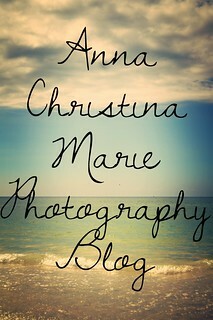 Oh and would you also read my stories on my blog and tell me how you like them? I'm a new writer and would love, love, love feedback!